Intra-Seasonal Variability Intra-seasonal variability can raise water levels a moderate amount over long periods (here 3 weeks). Hurricanes and nor'easters (e.g., Irene) generate higher, shorter peaks. Sandy was unusual in generating a storm surge that persisted through 5 tidal cycles. All data are from the Chesapeake Bay Bridge Tunnel. MLLW = Mean Lower Low Water. Graph compiled from NOAA tide-gauge data by Dr. John Brubaker. 2009 High-Water Event The intra-seasonal high-water event of summer 2009 is evident in this water-level graph from the Chesapeake Bay Bridge Tunnel. The red line shows that the 30-day average water level was elevated from June through mid-July. Data from NOAA's National Ocean Service. Water Levels within the Bay A rise in Chesapeake Bay water levels due to intra-seasonal variability (red lines) has different effects in different locations, with mid-Bay locations suffering greater flooding. Graph courtesy of Dr. John Brubaker. 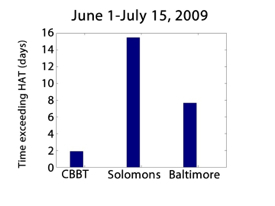 Higher than HAT Water levels exceeded the highest astronomical tide, or HAT, for 15 days at Solomons Island, Maryland during the 2009 intra-seasonal high-water event, and for 7 days at Baltimore. Graph courtesy of Dr. John Brubaker. Geostrophic Slope When the northward flowing Gulf Stream slows down, sea level rises along the U.S. East Coast. Graphic adapted from Noble and Gelfenbaum via Sweet, Zervas, and Gill. Underwater Grasses Persistent high-water events due to intra-seasonal variability can block the sunlight underwater grasses need for growth, and also make it more difficult to obtain aerial photography for monitoring purposes. Images courtesy of Dr. JJ Orth. 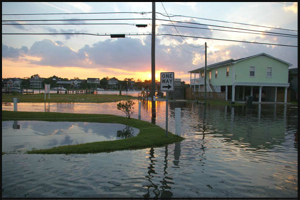 The effects of storm surge and sea-level rise have become topics of everyday conversation in the days and weeks following Hurricane Sandy’s catastrophic landfall along the mid-Atlantic coast. Ongoing research by professor John Brubaker of the Virginia Institute of Marine Science is throwing light on another, less-familiar component of sea-level variability—the “intra-seasonal” changes that occupy the middle ground between rapid, storm-related surges in sea level and the long-term increase in sea level due to global climate change. Intra-seasonal variability—which Brubaker says takes place on time-scales of 10 to 90 days and can add or detract a foot or more from the predicted tide—is likely due to shifts in oceanic currents and large-scale movements of water masses along the coast. It often goes unacknowledged in discussions of sea-level trends, but can play an important role in water-level forecasts, coastal activities, and ecosystem health. “Intra-seasonal variability has significant impacts,” says Brubaker. “For instance, being aware of these non-tidal, non-storm anomalies is very important for forecasting. If you’re experiencing a relative high during the approach of a storm, with water levels already elevated by a foot or more above predicted tides, that could make a big difference in terms of storm surge and coastal flooding.” Indeed, graduate student Carissa Wilkerson, whom Brubaker co-advises, is studying how intra-seasonal anomalies combine with storm surge as part of her Master's research at VIMS. Brubaker, who teams with researchers John Boon and David Forrest on the Tidewatch Forecast system at VIMS, says the Tidewatch forecasts account for at least some part of intra-seasonal variability by using as their starting point a moving average of the most recent 30 days of sea-level measurements. Other forecasts use mean sea level, a tidal datum that NOAA defines as the average measured over the years 1983-2001. Periods of unusually low water could also affect seagrasses and other marine life, says Brubaker, but the impacts are likely to be less significant because the long-term rise in sea level tempers their effects. 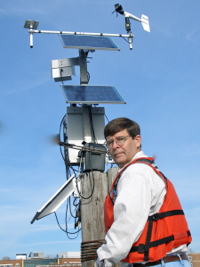 Brubaker’s interest in intra-seasonal variability was piqued during summer 2009—when a prolonged period of high water affected the U.S. East Coast—and again during the shorter period of unusually high water during May 2011, which he experienced first-hand while teaching a course at VIMS’ Eastern Shore Lab in the seaside village of Wachapreague. Three NOAA scientists, Bill Sweet, Chris Zervas, and Stephen Gill, subsequently issued a technical report to describe and explain the 2009 event. They note that water levels of 0.6 to 2.0 feet above predicted tides persisted for up to 6 weeks in areas from North Carolina to New Jersey, with slightly lower elevations experienced as far south as Florida and as far north as Maine. If intra-seasonal changes in sea level aren’t generated by regular tides, storm surge, seasonal heating or cooling, or long-term sea-level rise, what is their cause? 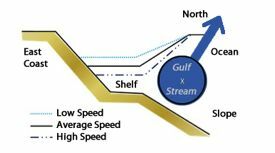 Sweet, Zervas, and Gill attributed the 2009 event to the confluence of two factors—persistent winds from the northeast measured far offshore, and a slow-down in the Gulf Stream. Brubaker says the northeasterly winds contributed to high water along the coast due to “Ekman transport,” a phenomenon in which surface waters begin to move to the right of the prevailing wind because of the Coriolis force. “The Ekman transport associated with these winds would push the water towards the shore,” says Brubaker. Persistent offshore winds from the northeast were also measured during May 2011. Brubaker’s interest in intra-seasonal variability focuses on using tidal records from the last 15 years along the U.S. East Coast to better understand the frequency, magnitude, and duration of high-water events in the region. He’s also interested in how these events propagate spatially through coastal water bodies like Chesapeake Bay. He says the data also suggest an intriguing correlation between the high-water events and the occurrence of El Niño in the Pacific, as measured by the “Oceanic Niño Index,” a commonly used measure of El Niño-La Niña activity. Explaining further, Brubaker introduces the term “highest astronomical tide,” or HAT, which is the highest high tide predicted for any particular tidal station. “Near the Bay mouth, at the Chesapeake Bay Bridge Tunnel, the HAT is 2.5 feet above mean sea level,” says Brubaker, “but at Solomons Island in the mid-Bay, it’s only 1.1 feet—so there’s a big difference. In 2009, water levels were elevated at all the tidal stations in Chesapeake Bay for about 6 weeks from June into July, but at the Bridge Tunnel they only exceeded HAT for 24 hours, a cumulative total of 2 days. At Solomons, by contrast, the water level exceeded HAT during almost every high tide. In fact, there was a period when the whole tidal cycle, from high through low tide, remained above HAT. All told, water levels at Solomons exceeded the HAT for a total of 15 days from June into July. “The bottom line,” says Brubaker, “is that the same rise in water level will have different impacts at different locations in the Bay. Even though the water rises uniformly, the relative impact will differ by location and the level of the highest astronomic tide. HAT is an important datum for ecosystems, and it should be an important datum for people too. City planners, waterfront property owners, and land-use decision makers shouldn’t build too close to the HAT where they live. When they do, they’re likely to get in trouble."